Google is a multi-billion-dollar advertising company, but because it controls a huge portion of the globe’s flow of information, it’s managed to represent itself as something more — an elite institution dedicated to furthering human knowledge and encouraging freedom. Its parent company Alphabet funds, sometimes at a loss, scientific “moonshots”; one subsidiary, Jigsaw, is devoted to developing technologies that will “make people in the world safer”; and it funds scholarly research and think tanks, like the New America Foundation, that help develop policy for the 21st century. But for all this (no doubt honestly believed) purposefulness, Google is still at its core a profit-seeking advertising company, and its quest to enable the flow of ideas and information seems to stop short in a couple places — in particular, near information about the company’s power, and the idea that Google is an anti-competitive monopoly hurting the economy. The Open Markets group led by Lynn contains many of the most respected voices in an increasingly prominent discussion about technology and telecom monopolies, and its findings about corporate consolidation and monopolistic power have been extremely influential in turning antitrust into an important policy issue — to the extent that the Democratic Party has included stricter antitrust regulation as a plank in its platform for 2018. Lynn’s endorsement of the EU decision ran into a bit of a snag, however. 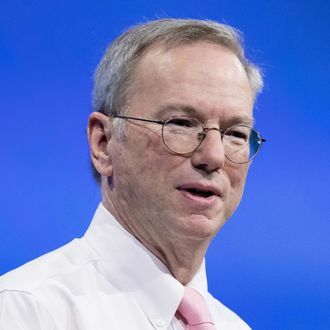 Google is a major donor to New America, and Google executive chairman Eric Schmidt chaired the organization until 2016. According to the New York Times, New America’s president Anne-Marie Slaughter spoke to Lynn a few days later and wrote in an email that New America and Open Markets would be ending their partnership. In a limp response to the Times report, Slaughter said that she had been working with Lynn over the past two months to spin Open Markets off. She did not dispute the quoted emails in the article, but said that they were taken out of context. The sequence of events is circumstantial but highly suspicious, because Google’s attempts to influence policy and regulation are far from secret. More than any other tech company, Google spends millions on lobbying and think tanks. It’s particularly aggressive meddling in the halls of power has also led it down more dubious paths, like funding academics, sometimes undisclosed, to produce papers favorable to Google’s policy aims. Why then did this particular statement from Open Markets cause a rift? After all, as Slaughter points out, “After more than 10 years of doing strong policy work at New America, Open Markets’ position is not news to Google.” The difference is that, stuck with a $2.7 billion fine, Google and Schmidt are now feeling substantial tangible effects of Open Markets’ work. Calling Google a search-engine monopoly (and a duopoly, alongside Facebook, in online advertising) is fine for the company, so long as it’s just a PR problem and some slap-on-the-wrist regulatory fines to ride out. But as the EU continues flexing its regulatory muscle, and American politicians start looking at the situation more critically, thorough study of the tech industry’s monopolistic presence becomes less of a theoretical hazard and more real. Lynn’s contentious blog post wasn’t just advocating for new rules, it was applauding punishment that a growing number of industry watchers would say that Google deserved. Google and its cohort of market-dominant tech giants have long sold themselves as benevolent corporate stewards. “Don’t be evil” used to be the company’s unofficial motto (key words: “used to be”). But directly funding that sort of open criticism serves only one of Google’s two main interests, which are the publicly stated goal of making information widely available, and the privately stated goal of making a ton of money. Google’s technocratic altruism is now starting to affect its business, and Eric Schmidt can’t have that. It’s not hard to see which of Google’s twin goals it loves more.